Frustrated by QuickBooks®? 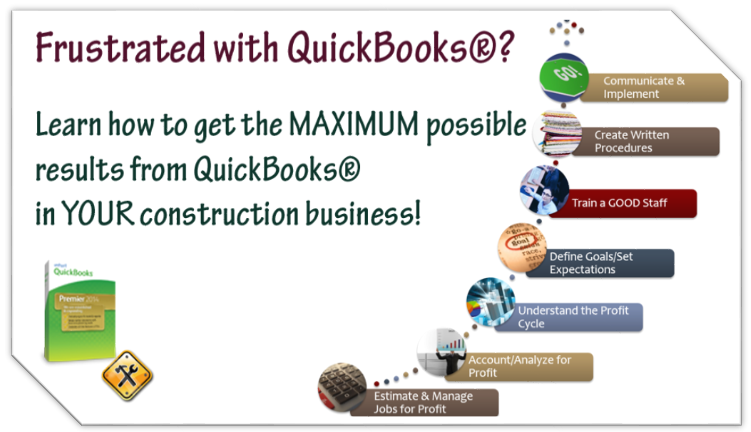 Learn how to get the MAXIMUM possible results from QuickBooks® for your construction business! Running a construction business is a difficult job, especially in this economy – when now more than ever you need to rely on accurate job costing. you are so frustrated and uncertain that you are spending hours updating complex Excel spreadsheets, or worse yet you are trying to keep it all in your head! QuickBooks® is a generic bookkeeping and accounting program, designed to be used by every type of business that you can imagine. If it was industry specific, well it would have the same big price tag! Sure Intuit makes a “Contractor” version, but even then it’s designed to meet the needs of every type of contractor – from the handyman to the bridge builder. Are you looking for new ways to decrease your labor burden on prevailing wage projects, get your equipment costs into job costing reports, or increase your cash flow? When the bottom-line profit from your business appears to be shrinking – it’s a given that you need to assess the situation and turn it around. Wondering where all the cash is going and if all of the job costs are being captured is enough to baffle just about any business owner. We’ve worked with contractors, such as yourself, for many years. We can provide you with reasonably priced training materials that will allow you to achieve the MAXIMUM possible results from QuickBooks® in your construction business. Our eBooks provide you with step-by-step instructions for high end construction software specific tasks; such as getting equipment costs into job costing reports, tracking General Liability Insurance (when it’s based on gross payroll), etc. Live, internet based training webinars are convenient and affordable. All you need is a computer with audio and video capabilities; plus a high speed internet connection. Pre-recorded videos are ideal, you can watch them at your convenience. Learn techniques that will help you setup QuickBooks for your construction business and improve your job costing techniques. Everybody loves freebies! Free QuickBooks tips, tricks and techniques via articles, eBooks and recorded videos. Would you like to be notified when new QuickBooks related training items are added to this site? Enter your email address below and we’ll notify you when there’s something new available.